Highs: Getting to see Machu Picchu with my own eyes; ceviche; taking a plane from Cusco to Lima. Lows: The annoying people in Cusco trying to sell you things. the day/night making every single breath strenuous. 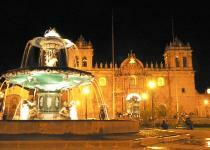 Smells: Street work in Cusco; street food. Sounds: 'Want massage? '; 'Want a postcard? '; 'Want to see my paintings? '; waves crashing in Lima. around Cusco with llamas; walking down the coastline in the Miraflores section of Lima; cevicherias. Purchases: Wool hat; wool gloves; wool socks. Street Food: Corn; fruit; popcorn. Different Food Finds: Cuy (i.e. guinea pig); alpaca; black corn on the cob in the grocery store. Gym; Martinizing (all in Lima); Hooter's; Starbuck's; Tony Roma's; Dunkin' Donuts. Type of currency? Peruvian Soles. About 3 soles is equal to $1 US. Wallet Friendly? Yes. Extremely! A great meal might cost $3-4; a nice place to stay is $10. 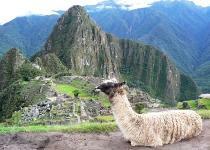 Things Peru Is Known For: Macchu Picchu; Inca Trail; ceviche. In Lake Titicaca - Islas Flotantes. Machu Picchu and a llama..